Starting today way more relaxed than normal. Will be out for some meetings in a couple of hours and after that I will have my weekly torture bootcamp session. 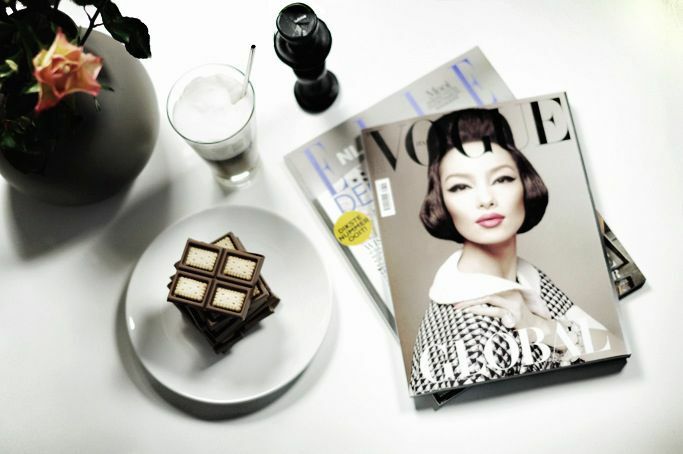 So since I need to fuel up first I’m going to putt my feet up, read a good book (the latest Vogue magazine that is ;)), drink my daily latte macchiato and have a chocolate bar for lunch! Chocolate have always been my guilty pleasure, I just can’t resist. So when there is a box full of Milka bars in the house it’s just a matter of time (or do I need to say seconds?) before I dive in to it. Now I have two options: 1. I eat all 20 bars by myself and will probably need a bootcamp work out every single day to undo the damage or option 2. I will share some with my lovely readers. Hard decision. ;) But, then again; good things need to be shared and I really don’t want to gain 5 kilos since they taste so damn good. Just finished a whole bar of Milka X Lu and I’m now seriously considering to get another one. And honestly, the combination of Milka X Tuc really sounds completely strange. So you should really try it yourself! Just drop me a comment if you like me to send you a little bit of chocolate heaven! PS: How cute are the flowers I got from my bestie for Valentine? hmmm ik zou ze graag willen proeven! Klinkt inderdaad als een gekke combi, maar zou het best willen proberen! Perfect way to spend a morning! you make me wanna have chocolate! Ik zou ze graag willen proberen! Yumm. I tried to try that milka!! Sounds like the perfect morning ever. I will definitely love some. Sounds like the perfect morning ever! I will love some of that delicious chocolate. Jaa lekker ik wil wel graag de tuc variant proberen! In love with Milka too, one of my weakness/pleasures, enjoy! Jaaaaaaaa!!!! Chocolade ziet er jammie uit! <3 Die wil ik proeven! Klinkt heerlijk! Met lu klinkt het goed, maar tuc een beetje apart haha. Ik ben heel benieuwd naar die combinatie inderdaad! OOOOOH CHOCOLAAAAAA! Ik krijg er meteen zin in! haha chocola is ook altijd mijn zwakke punt! Succes dit weekend! It must be delicious! Both of them! Oh yes please, haha! Although I shouldn’t ;-). I’ll need two bootcamp sessions a day, haha! Love your blog! The black padded skinny jeans from zara you wore on your previous post, are they from the new collection? Ik ben heel benieuwd en zou het graag proberen! Oeee, lekker! Ik wil hem ook wel proberen!